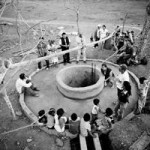 Clean water means a healthier future for rural Nicaraguans. In partnership with the people of Nicaragua, we help them build a future for themselves. Providing clean drinking water is the core of what El Porvenir is about; sanitation is necessary to ensure that the water is clean. In addition to sustainable water and sanitation projects, we provide health and hygiene education and reforestation. Our vision is for a Nicaragua where villagers achieve a better quality of life particularly through improved health and easier access to clean water. El Porvenir does not initiate projects; staff members respond to requests for assistance from rural villages. Village residents elect their own project committee, provide all labor on a volunteer basis, and take responsibility for the long-term maintenance of all projects. El Porvenir encourages the community to include women among the committee members. El Porvenir provides technical expertise and training, lends tools, and funds the materials needed to complete the projects. Community health education staff visit the projects periodically after their completion, to work with the villagers to help them maintain their project, so that it will continue to provide for the community’s water and sanitation needs.